The AFL fears some are drifting away from the game because of issues including food prices. AFL spokesman Patrick Keane said food and drink prices were important but there was little the AFL could do to force venues to lower costs. “Every venue in Australia operates under its own model for how it can make a commercial return on events at its ground,” he said. “The AFL is keen to see football fans across Australia attend our games in large numbers and then be able to enjoy their day at the football. Note: Alcohol is not affected by the changes. Serving sizes will remain the same. Members and fans will be able to purchase popular food and beverage items at the MCG at prices not seen for a decade or more, following a new agreement that will set the MCG apart from every other Australian stadium. MCC, together with its hospitality partner EPICURE, today announced a $14 million investment over the next seven years that will deliver fans an affordable, family-friendly food and beverage offering at all MCG events. This means that prices of some products have dropped so considerably that they are consistent with what fans experienced at the stadium more than decade ago. It was revealed that sales of pies, hot dogs and chicken schnitzel burgers at the home of AFL and cricket spiked by more than 60 per cent. The traditional favourite food of the footy fan, Four ‘n Twenty pies will retail at Etihad Stadium games on a Sunday for just $3 – it’ll be the cheapest price for a pie at any of Australia’s AFL venues. As previously announced, children under the age of 15 will be permitted to all Sunday AFL games free of charge and Etihad Stadium is also delighted to announce that the traditional ‘kick-to-kick’ at the end of Sunday games will be trialled during April and May fixtures. For the entire 2015 Toyota AFL Premiership season, it has also been determined that commercially and domestically prepared food and drinks (other than alcohol and glass ware) will be permitted into the venue. Etihad Stadium in conjunction with the AFL is able to announce that the traditional ‘kick to kick’ will be trialled after Sunday fixtures in April and May. “A review of food prices has been undertaken and whilst final prices are still being finalised, there has been a commitment to maintain 2014 prices on key retail items such as chips, hamburgers, hot dogs and drinks,” he said. But before footy fans start thinking about boycotting the menu at Domain Stadium, the price of food and drink in 2014 was relatively cheap compared to the national average at other major stadiums around Australia, according to the WAFC. 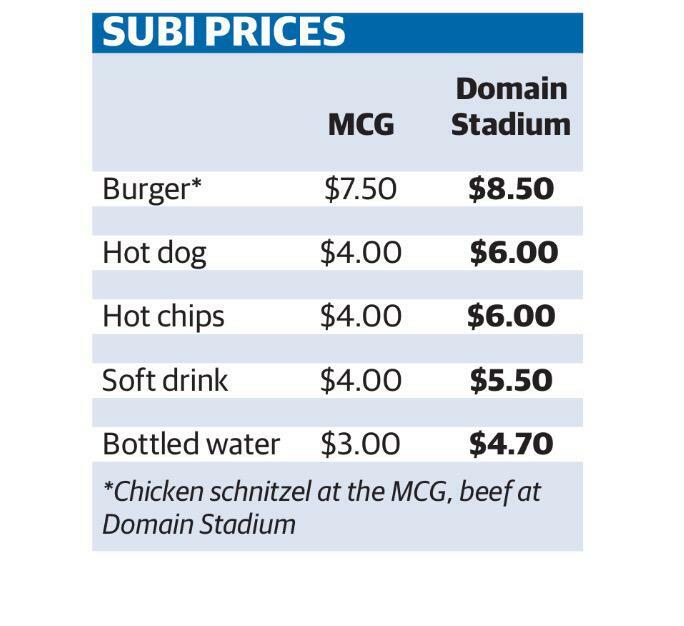 A burger at Domain Stadium set you back $8.50 last year, when the national average was $9.67. Fish and chips was $9, while the average last year was $10.49. In fact, all the food and drink at Domain last year was cheaper than the national average except for a 600ml soft drink (14 cents more expensive at $5.20), a hot dog ($6 compared to $5.81) and a bottle of water ($4.70 versus $4.61). But The West Australian can reveal that local fans will pay more than 50 per cent more for some items than those at the MCG. For example, Adelaide Oval – which an Adelaide newspaper last week claimed had the most expensive food and drink pricing in the country – sells hot chips for $5. Hot chips are $6 at Domain. A pulled pork roll is $12 here and $9 in Adelaide and chicken strips with chips cost $12 at Domain compared with $6.90 for chicken nuggets and chips at Adelaide Oval. The Domain Stadium prices are on a par – and in some cases more expensive – than food and drink at Etihad Stadium, according to the Melbourne venue’s menu from last year. No change at this time. The Oval does allow fans to bring food and sealed bottles of water and soft drink into games. Free filtered water is also provided at the Oval’s bars and in parents’ rooms. ADELAIDE Oval is the most expensive place in the nation to buy food and drinks at the footy. An Advertiser analysis of food and drink prices at 13 AFL venues across the country found the Adelaide Oval topped the list. A family buying hot chips, a meat pie, hot dog, chicken burger, a soft drink and water would be charged $37.30 at the Adelaide Oval. The next most expensive was $34.90 at Subiaco and $34 at the SCG. Mr. Chandler said there was no plan to cut the price of food at Adelaide Oval. “If we feel that we can provide better value we’ll certainly do that. “But at the moment we believe our pricing is competitive and we’ll continue to run competitive stadium,” he said. No data was found for the SCG or Gabba. How dare domain charge such horrendous prices for food and drink . For god sake $6.00 for hot chips and $5.00 for a drink .